Inflight Wi-Fi is becoming a required feature for many cross-country travelers, especially for flights that last more than four hours. 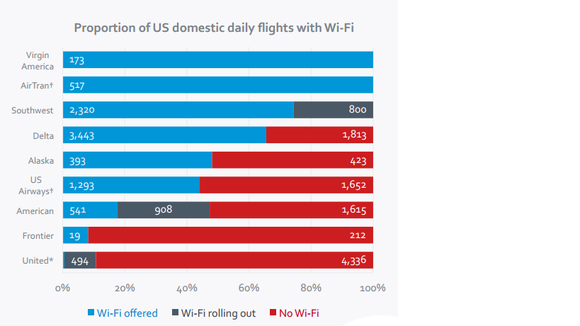 Even though onboard Wi-Fi is becoming more common, however, Internet connectivity is only available on 38 percent of U.S. domestic flights, according to a new report by Routehappy.com. 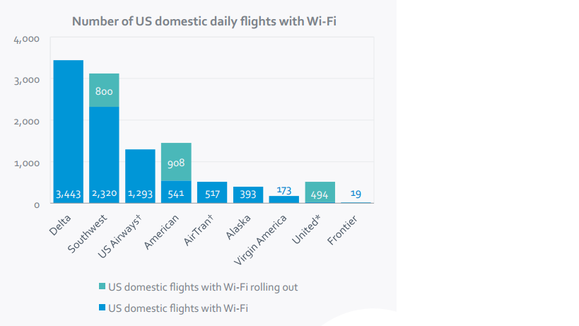 The site, which ranks flights according to length and onboard amenities, took a look at its database of U.S. flights to figure out the state of inflight Wi-Fi for U.S. domestic and international flights. The result? There’s a lot of Wi-Fi out there, and more is rolling out over the next two years. But right now, if you want to guarantee your domestic flight will have Wi-Fi, you’d better do your research on sites like Hipmunk and Kayak that detail Wi-Fi options for each flight. If you can’t do that, here are three big takeaways from Routehappy’s study to help you figure out which airlines offer the best bets for inflight Wi-Fi. Anybody who flies a lot knows that if you want to guarantee Wi-Fi on a flight, the best bet is Virgin since the company has Internet service on 100 percent of its fleet, as does Southwest-owned AirTran. But it’s not always possible to fly with your carrier of choice, so what about the other guys? 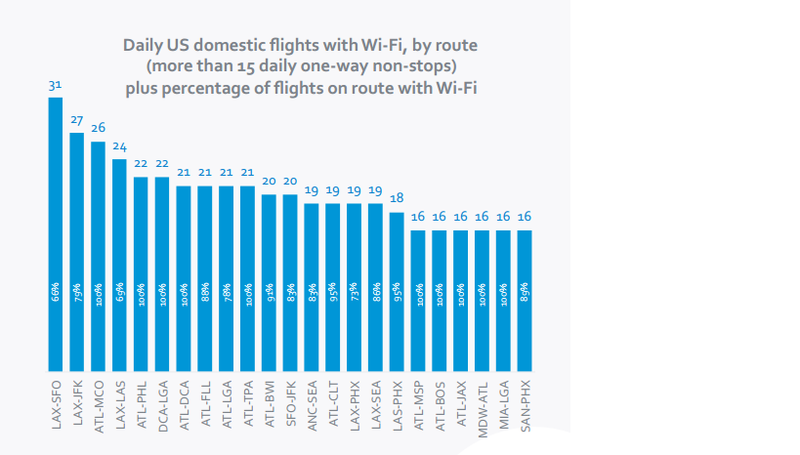 Based on sheer numbers, Delta and Southwest offer the most domestic flights with Wi-Fi on a daily basis, Routehappy says. Delta offers more than 3,000 Wi-Fi flights, and Southwest has around 2,300, with Wi-Fi rolling out to another 800 planes in the coming months. After Delta and Southwest, Wi-Fi numbers take a nosedive with U.S. Airways (which is merging with American) offering nearly 1,300 daily flights with Wi-Fi. American is the next runner-up with little more than 500 Wi-Fi-enabled planes and another 900 soon scheduled to carry the functionality. But numbers are only half the battle. The other question is which airline offers Wi-Fi most consistently? In other words, how many flights take off without Wi-Fi every day? Even though Delta has more Wi-Fi flights, Southwest actually offers fewer daily flights without Wi-Fi—800 disconnected flights compared to Delta’s more than 1,800, according to Routehappy. Bottom line: If Virgin or AirTran are out, look next to Southwest or Delta. But what if you need to plug in to keep your laptop running on that 5-hour journey from New York to Los Angeles? Virgin again is the airline choice for tech travelers since all its planes offer ways for you to plug in. United’s premium service flights between New York, San Francisco, and Los Angeles also come with plugs for all. Things get a little dicier after Virgin and United. 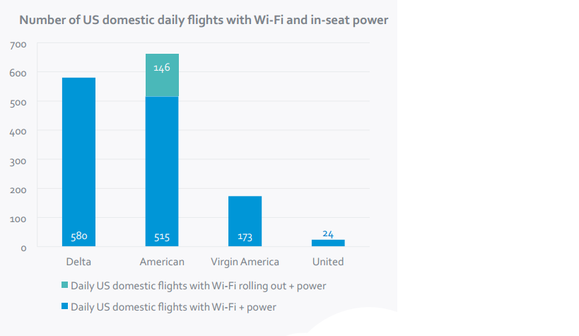 Delta offers power on just 580 daily domestic flights that offer Wi-Fi, with American coming in second with 515; however, power outlets are currently rolling out to another 146 Wi-Fi-enabled American flights. As for regular United flights? Only 24 daily departures offer electricity and Wi-Fi for the masses, Routehappy says. Bottom line: If you’re low on battery power, better charge up before your flight. Destinations also play a role on whether you can count on Wi-Fi. Routehappy found that even though only 38 percent of U.S. domestic flights offer Internet service, Wi-Fi is available for 44 percent of U.S. domestic flying time. In other words, longer flights are more likely to offer connectivity. That being said, the route with the most Wi-Fi turns out to be Los Angeles-San Francisco, perhaps due to the influence of Silicon Valley. Next up is Los Angeles- New York (JFK), followed by Atlanta-Orlando. Thanks to Atlanta’s prominence as Delta’s main hub, Atlanta has the most domestic Wi-Fi flights overall, the study says. So those are the big takeaways from Routehappy’s plunge into the state of domestic inflight Wi-Fi. But there’s more to flying with gadgets than just inflight Wi-Fi. Take a look at TechHive’s survey of the top 10 tech-friendly U.S. airlines to see what other factors tech travelers should take into consideration when flying the friendly skies. This story, "Your best bets for finding Wi-Fi on domestic flights" was originally published by TechHive.